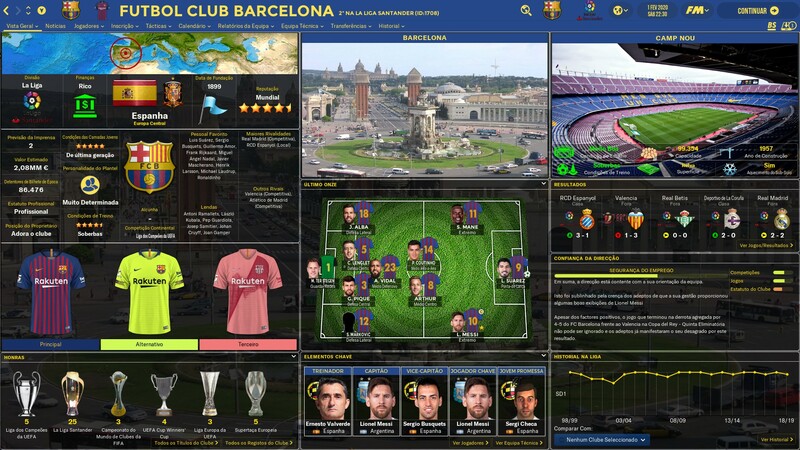 Skin for FM 2019 regular career mode and widescreen (1920x1080). This is the FLUTSKIN – Dark Version 1.8 for FM 2019. This is the FlutSkin for FM19. I tried to keep it similar to the latest version of Flutskin for FM18. Thus, I will not present you all changes regarding the default skin for FM19, but there are many of them. If you don't know FlutSkin yet, try it. I think you will not be disappointed. 1. “Round country flags”, “round continents logos” and default logos specially made in metallic style by brian-q from sourtitoutsi. Those graphics will be displayed in the title bar. 2. Background maps for confederations, also made by brian-q. Thank you brian by your great work and for your collaboration!!! Once again, thanks to all FM fans (your suggestions keep me trying to make the skin better) and especially to all the fantastic FM skinners whose creativity contributes a lot to produce the FLUTSkin as it is today since FM 2013. Thank you all!! A special thank you to PATRES10 from fmslovakia for the 2D default kits (especially tailor-made for FlutSkin). As always FlutSkin is completely free to download and I hope you enjoy it. However, if you want, you can reward my work donating whatever amount you wish. Any small amount is really appreciated. This skin was made to work properly in 1920x1080 (1080p) full screen mode, sidebar icons only. As a result, some panels won’t work properly in other resolutions (and also in 1920x1080 windowed mode). In this pack I included a read me file in order to install the skin, the pitch textures addon and the regular and coloured sidebar. I also included a TUTORIAL PDF with instructions regarding the structure of your Graphics folder in order to view the citypics, the kits and the competition logos in player details and in title bar. Start FM19 and go to Preferences screen and then into the Interface tab. You should see FM 2019 Flut Skin dark - Version 1.8 as an option in the skin drop down of the Overview box. 482 comments have been posted so far. Hi Tiago: could you please put a screenshot? Scouting panels in the players profile show a message saying "scouting in progress" when I'm not scouting that player. Im not sure if this is a skin or a game bug, but anyways i hope you can help me. Hi Flut, the link MediaFire seems to fail with me. I'm the only one ? However, if I'm here, it's for a problem that I encounter in any games I create, any clubs I see in the game (look picture). Do you have an issue for that ? Hi DexterHovis: you should use the pack with the 2D kits for flutskin. r2d2: the skin is only for career mode. anyone knows if flut skins with stadium for example works on FM touch 2019? @richbell82: Do you mean the leagues in focus panels 2-5 remembering your changes? I'm still getting the same problem with that unfortunately. In the player overview I've got a picture of the stadium covering part of the player's picture. I'd be grateful if you would please advise me as to how I can remove the picture of the stadium. I've tried using the method described by panzerM [I think he was describing how to solve this problem] but that didn't work for me. Hi Bartdude, mykal and Carter: thank you!!! begbarros and Tobe:please read the comments in the thread. swainf: I don't play with ingame editor. Thus, sorry but I can't help you. I can't click on National flag while I used In-game. how do I get the Stadium Picsin the player profile? Carlito_85 did you have any luck with that coding on the competition news league overview panel.xml file? Hello Flut you are fantastic thank you very much god bless ! Some fine touches to a masterpiece. Thanks for the update Flut. Flut, I can totally understand you, and I am therefore indebted to you! Believe me, I´m very happy with the best skin ever! Hi magic: As I said in my last comment, I am very busy and also tired. Thus I only intend to answer regarding bugs and requests for next versions. The issues related to the personal taste of each FM player I intend to not answer. Regarding your answer, as I also said in my last comment, the next release (maybe today...) will include your request. Cheers. Kfnielsen: as I said before I don't know what happens in some games where that bug arises. In my game everything is okay. Magic: I will include it in the next version I will release soon. Jonh Watson: I will not include any real scoreboards. Postie75: yes is possible. However I have no time to explain you how you can do it. Sorry. Mykal: you can change the fonts in the fonts folder. Edit the xmls matchtitlebar, titlebar and namex (the different fonts from the default I included in the skin. Handcrafted in Symi, Hellas. Page created in 0.649 seconds.